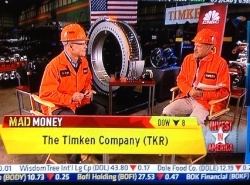 Last night, ABMA member The Timken Company hosted CNBC’s Mad Money at their Faircrest Steel Facility. During the show, Jim Cramer interviewed Timken CEO Jim Griffith who discussed manufacturing innovation and growth in the United States and the impact of bearings and steel on the global economy. For a recap of the broadcast and video of Jim Griffith on Mad Money, please click the links below.